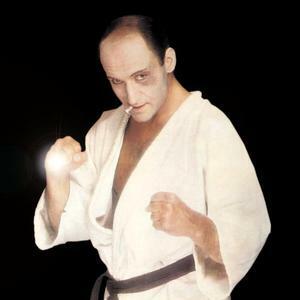 Franek Kimono is a fictional character which was meant to be a polish version of Bruce Lee. It was created by Andrzej Korzy?ski, while Piotr Fronczewski (famous actor) played the role of martial-arts master from Poland. The first EP, containing hits like "King Bruce Lee - Karate Mistrz" and "Dysk-D?okej", saw daylight in 1983, and due to its great succes the first long-play was released a year later. Franek Kimono, despite being sort of a musical joke, made a huge succes in Poland. Great dose of humour and absurd present in most of Franek's songs lifted them to almost cult status. The first EP, containing hits like "King Bruce Lee - Karate Mistrz" and "Dysk-D?okej", saw daylight in 1983, and due to its great succes the first long-play was released a year later. Franek Kimono, despite being sort of a musical joke, made a huge succes in Poland. Great dose of humour and absurd present in most of Franek's songs lifted them to almost cult status. By the end of eighties another LP was released under the title "Na Progu Raju" (At The Edge of Paradise), but this time Piotr Fronczewski played the role of Crazy Zdzich - Franek's alter ego. Once more he took place behind microphone in 1998, as Mr. Kimono, but the new album was not recieved well - perhaps because Andrzej Korzy?ski did not take part in the project this time.